El Espectacular - The South American Football Blog: Chelsea Wanted Pellegrini? Manuel Pellegrini's agent, Alberto Poletti, has claimed that Chelsea were in contact with him to find out the availability of the Villarreal manager, after sacking Jose Mourinho earlier this season. 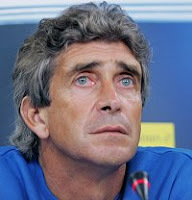 It also seems that Atletico Madrid held an interest in Pellegrini. "In the last months Atletico Madrid showed interest in him but as he had given his word to Villarreal he will stay with this team until his contract expires and a few weeks ago some people from Chelsea has asked me about him. "Since Mourinho left Chelsea there have been many candidates for that position and Pellegrini has been one of the names proposed for that position. "Pellegrini is very interested in working in England because they have one of the most important leagues in the world and Pellegrini is sure that he has the capacity to work there". With Pellegrini out of contract with Villarreal at the end of the season, this could be seen as Poletti trying to raise the Chilean coach's stock with potential suitors, especially in England. Whether there is any validity to the Chelsea claim is any-one's guess.